Dan Gale, Roger Attfield and William Werner's Shakhimat made a big move down the backstretch in Saturday's G3 Tropical Turf Stakes, taking the lead before the half-mile pole. Jockey Edgard Zayas had judged his mount perfectly, however, as he had enough horse left to hit the wire three-quarters of a length in front at odds of 11-1 on the tote board. 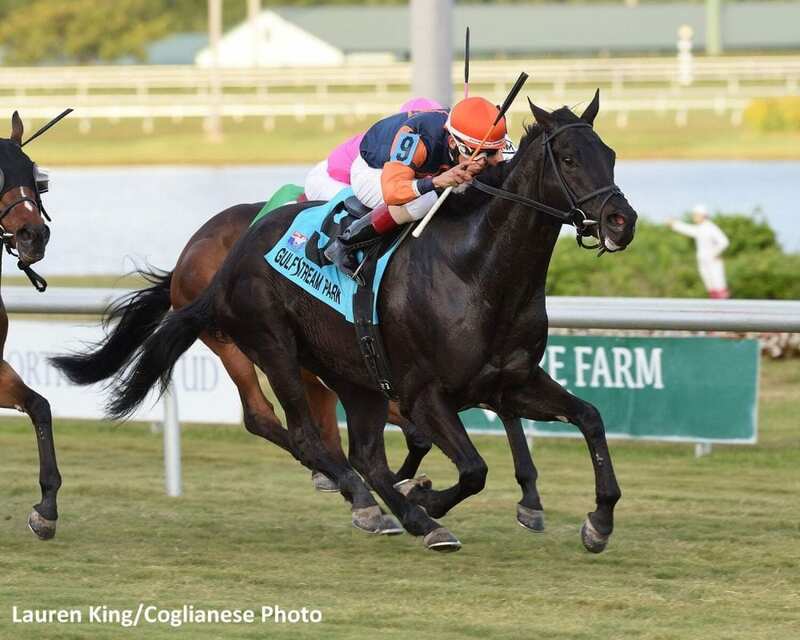 Trained by Roger Attfield, the 4-year-old son of Lonhro covered a mile on Gulfstream's firm turf in 1:36.03, while 2-1 favorite Blacktype had to settle for fourth. Shakhimat ($25.20) hit the wire three-quarters of a length ahead of Galton in 1:36.03 over a firm turf course. It was another quarter-length back to Attfield-trained Grade 2 winner Tower of Texas in third. Blacktype, the 2-1 favorite trained by Christophe Clement, trailed the field early and rallied late for fourth by a nose. Clement had won four of the past five runnings of the Tropical Turf; the only exception came in 2015 when he did not enter a horse. Western Reserve was fastest from the gate and was in front through a quarter-mile in 25.10 seconds, flanked by Shakhimat to his right. Jockey Edgard Zayas gave the 4-year-old Ontario-bred gelding his cue leaving the backstretch and they met no resistance, going the half in 49.74. Zayas had plenty left to repel a bevy of late challengers and give Shakhimat his first third career stakes win including the 2016 Transylvania (G3) at Keeneland. Shakhimat now owns five wins and nearly $400,000 in purse earnings from 16 career starts. Bred in Ontario by Frank Stronach's Adena Springs, Shakhimat was a $60,000 2-year-old at the Fasig-Tipton Florida Select sale. His first graded win came in just his fourth career start, but the gelding hadn't won a stake race since until Saturday. Overall, Shakhimat boasts a record of 5-2-3 from 16 starts with earnings of just under $400,000. This entry was posted in NL List, Racing and tagged blacktype, Edgard Zayas, Gulfstream, gulfstream park, Lonhro, Roger Attfield, shakhimat, tropical turf stakes by Paulick Report Staff. Bookmark the permalink.